Insurgency Sandstorm Review - Insurgency Gonna Hurt! Have you ever seen the beginning of Saving Private Ryan? Those first few moments of terrifying carnage that enveloped the shores of Normandy. Have you ever thought that it looked like fun? If so, then Insurgency Sandstorm might be a perfect fit for you. 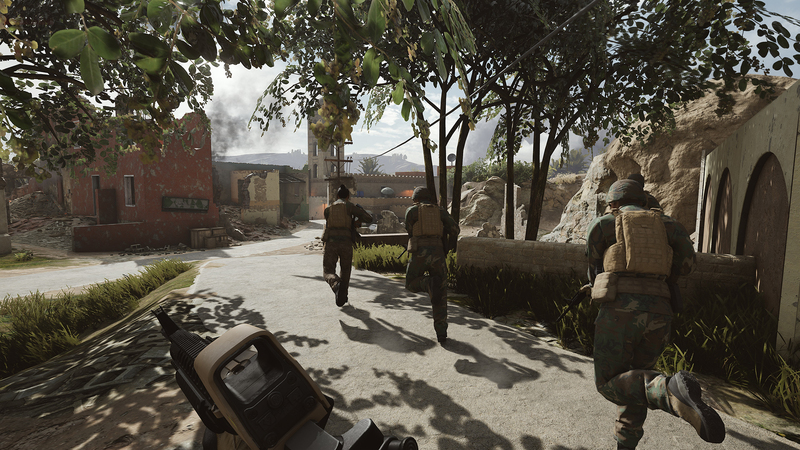 Insurgency Sandstorm is a tactical military shooter with a great deal of depth and death. Players can play cooperatively against the computer or competitively against each other as teams work to assault and defend various locations. It comes with all the hallmarks of a military shooter, but with surprising polish given that New World Interactive is still a relatively small studio. Weapons all look worryingly accurate, and the customisation options let you really focus on your playstyle. There are also cosmetic customisation options, for the player who wants their soldier to look their best. The maps are huge, detailed, sprawling desert arenas that often have a distinctly urban feel. The gunplay, arguably the most critical aspect of a tactical FPS, is tense, snappy and just great overall. A few stray bullets can take you out of the action so you’ll need to move quickly yet carefully and use the element of surprise as often as possible if you want to last more than a couple of seconds. You’ll see tracer rounds, muzzle flashes and walls spitting dust during intense firefights and it looks impressively cinematic. But where Insurgency really stands out in the sound design. Each weapon has a distinct voice that is cleverly affected by its surrounding. Firing in small enclosed spaces creates a nearly unbearable wall of noise while firing near a wall springs back a small directional echo. If I weren’t so busy ducking for cover, I could have marveled at this impressive attention to detail for hours. The different wail of a sniper rifle discharging across an open plain is powerfully frightening and almost poetic. Out of the three modes, I personally I enjoyed coop mode the best, which allows you and friends (or strangers, in case you don’t have any who are into these games) to attack enemy fortifications. While I enjoy military shooters, I’m not a professional player by any means and the two competitive modes had me constantly on the backfoot. One of the biggest downsides to Insurgency Sandstorm is that the game feels unwelcoming to anyone not already well versed in the genre. Although there indeed is a tutorial, you’ll still feel completely out of depth in the real game. And though it’s not necessarily the game’s fault, the community can be equally hostile to potential beginners. But in cooperative mode, which is by no means easy, you and your comrades have to work together clearing buildings, dashing across streets and raining down air support, with cinematic and emergent gameplay moments that you’ll remember for a long time. Already mentioned in my preview of the game a few months ago, the support system in Insurgency is still a work of genius. Players select roles from standard shooter categories such as demolitions and marksman, but also Commander and Observer. These two roles are vital as they are the only ones that call in support, such as artillery and strafing runs. To request this the Commander must be next to the Observer, and if either die the team will have to continue without any support. These roles are the most fun to play as your survival suddenly becomes a lot more vital to the team, but it does require a lot of communication and teamwork. Although death in the game is frequent, that doesn’t make it any less forgiving. Dead players are taken out of the game until their team can complete an objective which triggers a respawn. This means teams that suffer at the very beginning of a push are probably going to lose, while defenders will have to be aware which entry points are being protected as their numbers dwindle. It adds a great deal of tension if you’re one of the last few alive, but if you’re caught out early the wait can feel quite long. Perhaps the single most disappointing thing about Insurgency is the setting. We have seen desert combat so many times, especially in military games. It would have been nice to see the developers explore a new environment for this game, something that hasn’t been so ruthlessly pursued by other titles in the past, but it is ultimately a minor niggle of mine. If you are a fan of the military shooter subgenre, Insurgency Sandstorm is one of the best games released in 2018 with tight, varied combat, an incredibly visceral feel and some amazing visual and sound design. Just be warned that if you don’t like your shooter too serious, or too punishing, Insurgency Sandstorm might not be quite the game for you. Review code provided by the publisher. You can purchase the game from Green Man Gaming.